Now that you have Invisalign clear braces your teeth are going to be straightened without the need for unsightly metal brackets. This means that your confidence and social skills are going to be boosted. With a higher level of confidence comes more social interaction. 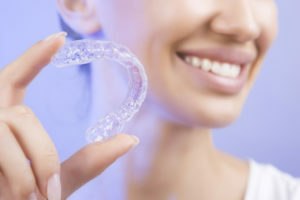 With social interaction often comes a common concern; “How’s my breath smell?” Today our Invisalign Orthodontist wants to share with you some of the best ways to he knows of to help keep your breath fresh throughout the day. Mouthwash is a great tool for fighting foul breath during the day. Just because you can remove your Invisalign aligners while you are eating, and no food will be getting caught in metal brackets, does not mean that food will not still be getting caught in your teeth. Swishing vigorously with mouthwash can help loosen trapped food particles from in between spaces in your teeth. Those trapped food particles, if left to sit, would otherwise begin to accumulate bacteria, turn to plaque, and cause bad breath. That same bacteria can also potentially cause tooth decay and gum disease. One of the best things about mouthwash is that it can be used at any time of the day and nearly anywhere. After meals, while you are at school or work if you feel like throwing a wrench in the works of bad breath then simply step into the nearest bathroom and give your mouth a quick swish. Water is another incredibly useful tool in the daily battle on bad breath. Many people do not realize exactly how important water is when it comes to fending off foul breath. Water facilitates the production of saliva in your mouth. It just so happens that saliva is your mouth’s natural defense against bacteria. Saliva does something amazing to bacteria. It has the ability to keep portions of it suspended in a type of temporary liquid prison. When you swallow, those portions of trapped bacteria go down with the saliva you just swallowed. It is then sent down into your digestive tract, which happens to be much better suited for effectively handling bacteria than your teeth and gums are. Just remember that while a wet mouth is a happy mouth, not all liquids will produce the same results as water does. Water contains no sugar or caffeine, an ingredient in many drinks, will actually make your breath worse. So the next time you find yourself feeling parched, skip the soda or juice and reach for some water instead. Yes, we are aware that you have been hearing this advice from dentists all your life, but there is a reason for it. Now that you have Invisalign flossing is still a quick and simple option for you because your clear plastic aligners can be removed! You won’t be having to fight through metal brackets with special flossing tools in order to properly care for your oral hygiene. Flossing removes trapped food particles from in between the spaces in your teeth. It does so even more effectively than mouthwash. Removing those food particles before they have a chance to accumulate bacteria and cause bad breath is one of the keys in preventing it in the first place. Like mouthwash, floss can be used anywhere at any time. It’s a simple and easy way to help prevent bad breath during the day. We hope these useful hints have helped give you a leg up in the battle against bad breath. You never know when you will get involved in a motor vehicle accident. It doesn’t matter if your vehicle is a car, a truck, a motorcycle, or even a bicycle. You may be driving carefully and minding your own business when, all of a sudden, you get hit by another motorist or an uninsured motorist. If you are lucky, your vehicle will have only minimal damage that could be covered by insurance. However, if you are not lucky, this could be the beginning of very serious trouble for you. You could sustain personal injuries that could result in serious consequences. This could involve soft tissue injuries, damaged body parts, broken bones, or fractured limbs that may greatly affect your life. In extreme cases, such motor vehicle accidents could ultimately lead to the wrongful death of an innocent motorist, leaving his or her family without a source of support and threatening their very livelihood. At out Law Office, we specialize in handling motor vehicle accidents of all types, including uninsured motorist claims. We understand the effect that any kind of accident can have on your life. For instance, you may suddenly be faced with huge medical bills, lost wages, and pain and suffering. We will do everything in our power to see to it that you are adequately compensated for your loss in a manner that never forgets what this incident has meant to you. If an uninsured motorist caused the collision, I can help you if your automobile policy includes uninsured motorist coverage. This means that a claim can be presented under the uninsured motorist aspects of your policy and your automobile insurance carrier will protect your interests. You have a right to claim not only economic damages – those that can be proven by medical bills and wage loss – but also damages for your pain and suffering and loss of enjoyment of life. If the person who caused the collision had insurance but his/her limits were not adequate to compensate you for all of your damages, you might be entitled to make a claim with your own insurance company if you carried uninsured/underinsured motorist coverage with limits of more than those of the person who caused the collision. Our attorneys been practicing exclusively in the area of personal injury since 1985. Over the years we have helped hundreds of clients with personal injuries seek compensation for their losses. As your lawyer, we can negotiate the terms of a fair settlement or, if need be, he can pursue your case in court. We have an outstanding record as a trial lawyer, deploying all available resources to conduct research, hire private investigators, interview witnesses, and engage expert witnesses to help improve your chances of prevailing. If you have sustained a personal injury as a result of an accident involving an automobile, a truck, a motorcycle, or a bicycle, or if you have lost a loved one due to a wrongful death, we can help. Call us immediately to discuss your situation. We offer a free consultation and a contingent fee payment method, which means we won’t get paid unless you do.